Hello all - I'm just starting an owner/builder pool in Phoenix, AZ. I will post more details and photos once I have some more time, but I have a couple of questions regarding construction options. I will have a section of raised bond beam with 3 sheer descents as a water feature. The raised portion will have 2 steps up tat are each 12" tall, so the highest section of the raised bond beam will be 24" above the std bond beam height. I want the raised area to be at least 18" wide so that kids and adults can use the raised bond beam section as a place to jump into the pool. The rebar is in my pool and the raised portion is formed out of rebar, but it's the same thickness as the rest of the bond beam around the pool. If I want the raised bond beam to be thicker (18") than the rest of the bond beam, should this be formed with the rebar and poured as part of the shotcrete? I plan to use either travertine or the artistic stone shell pavers as decking around my pool, and will likely use the same material for coping all around the pool edge. Besides the shotcrete, is any additional concrete needed for this type of decking? The pavers are typically installed on top of paced dirt and sand, and I think that the coping can be installed directly on top of the bond beam. Correct? You are asking far too complex a question for DIY's OPINIONS! (and without pics) I think that beam is going to require engineering and permitted. I hate doing those things but I don't believe you'll pass inspection without the engineering. We have a similar raised bond beam across the back of our pool. They just poured a footing along the back of the pool's bond beam and built the wall across the top of the new footing and pool bond beam. I don't remember a permit being required by the city. I think we are envisioning OP's pool plans differently. Thanks for the comments - This build is complete with engineering and is permitted, so maybe my questions aren't being understood correctly. I have a section of raised bond beam in my pool that I want to be wider than the rest of the bond beam around the pool. Should this wider portion be formed in rebar and poured with the shotcrete, or should the wider section be built using block after the shotcrete is already poured? 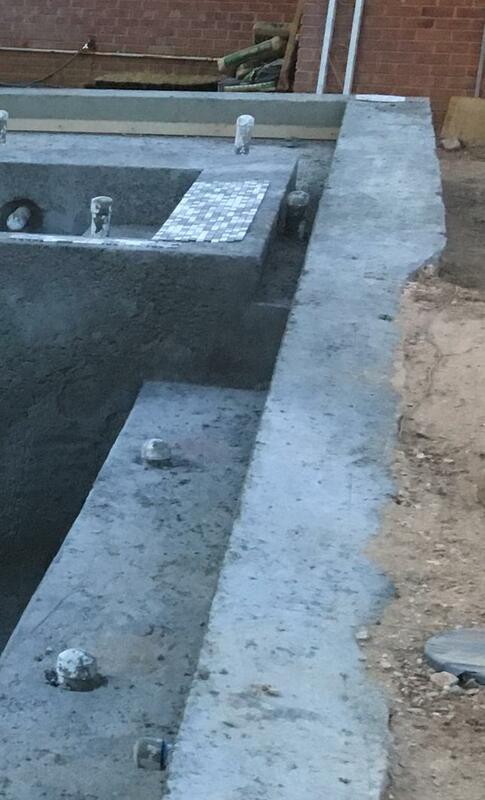 see below for a picture of a pool from another thread (not my pool) that has the type of raised bond beam that I referring to. It would seem like the smart way to do it would be to increase the thickness of the bond beam when you're having the shell shot in. You'll then have a monolithic structure to support the coping/decking on top of the shell. I think that would then minimize cracking down the road. It would also seem to be the least labor intensive method of providing that support, as they just need to set the forms 6" further out than they would normally. But, I'm just a guy with a pool. It would probably be worth a discussion with your gunite sub. They will probably be quite familiar with how it's done in your area, and you'll get a much more "right" answer.. Thanks.. If all goes well, I will have shotcrete late this week. I'll talk to the shotcrete sub about it and get their opinion. The rebar sub was confident that the rebar is fine as is, but I don't have enough experience in this area to know on my own.